As our On-Farm Habitats page explains, farms can potentially provide a variety of habitats which, ecologically, 'work' for some native species. The reports below document some of that biodiversity. Our point is not that all on-farm habitats or all farms do currently support unusual native species, rather that there is the potential for such support and, indeed, given recent changes in land use, a conservation need for considering how to accentuate that synergy. For at least the past 250 years, agriculture has played a major role in determining the landscape of Columbia County. Obviously, farms affect the native landscape. Were we not already a largely forested county, the negative impacts of agricultural openings on woodland organisms might be of concern (as it was in the 19th century). However, given the current scale of agriculture in the County, farms generally add to the native diversity of our county by providing potential refuge for grassland and shrubland organisms that might otherwise be largely absent. Many of these organisms found their original home in habitats that have diminished substantially at the national scale (e.g., prairies and wetlands). Thus, grasslands and shrublands of farms in our area can contribute to the conservation of species whose natural habitats have dwindled. We found that Columbia County farms are home to at least 350 species of native plants, of which around 10% are openland plants of conservation concern. We can cite at least 150 species of birds found on Columbia County farms; these include 25-30 grassland and shrubland species, many of whom are declining globally. Our farms provide habitat for at least 49 species of butterflies. While there does not seem to be a set of butterflies completely analogous to the grassland and shrubland birds, several species are tied to the openlands that farms help create. Our work with aquatic organisms added nuance to this picture. In most cases, it is difficult to argue that farms provide important habitat for these species. However, our results do suggest that careful farming can be compatible with many species and, in the case of pond amphibians, can actually provide useful habitat if those ponds are managed appropriately. In sum, we believe that there are conservation reasons for preserving working farmland in Columbia County. Farming does not come without potential envirionmental costs. However, given adequate safeguards and compared to the frequent alternative of large-scale development, we conclude that the conservation value of farmland supplements the already compelling socio-economic reasons for maintaining viable agriculture in our region. Illustrated Appendices of the 2006 Report - these appendices include a variety of materials for identifying on-farm organisms including grasses, amphibians and select butterflies. 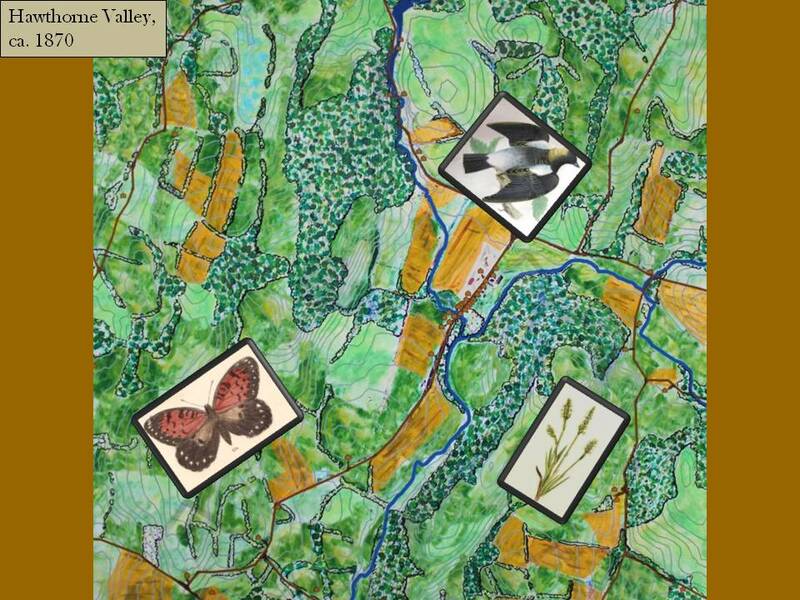 Openland Butterflies - a short report (2011) about the different groups of butterflies that occur in varying fields and other openings around the County; please see our Butterfly page for a list of all butterflies found in Columbia County and more information. 2011 book chapter on the history of agriculture and ecology in Columbia County NY published in "Environmental History of the Hudson River", edited by R.E. Henshaw; draft of the same paper but with more color and illustrations (and words! ): Ecology in the Field of Time. Draft chapter exploring soil history in Columbia County, with reflections on evolving relationships between science and soil in our area (~2012). Profiles of On-Farm Creatures in Columbia County, NY: The Effects of Nature on Farm Production; the Effect of Farm Use on Nature - a 2012 report summarizing results from the 2010 study on 19 Columbia County NY Tomato-growing Farms; additional information about the relationships between soil and plant health observed during that study are available upon request as a pdf version of a Powerpoint presentation given to participating farmers. Please email Conrad if you would like a copy. 2013 Natural Farmer Article about on-farm biodiversity, an illustrated explanation of our approach to working with on-farm biodiversity. See our Orchard Ecology Page for information about our research exploring the pests and beneficials of some Hudson Valley orchards.